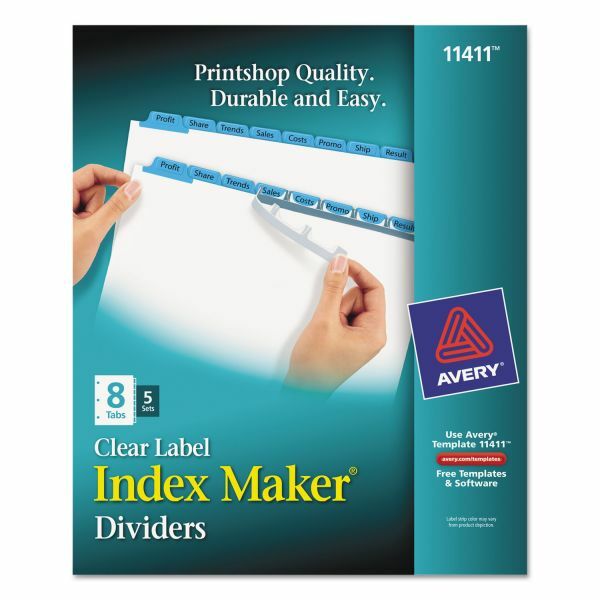 Organization is made easy with Index Maker® Dividers. Find reference or presentation materials more quickly with customizable color tabs! Easy to customize with free templates and designs from Avery Design & Print. 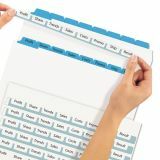 Avery Print & Apply Clear Label Dividers, 8-Tab, Blue Tab, Letter, 5 Sets - Make professional-looking dividers with your own tab titles. Label all tabs at once with Easy Apply clear labels. Perfectly align tab labels and label multiple sets quickly with Easy Apply label strips. Label sheet for labeling tabs individually is included in every pack. Format the clear tab labels using your existing software and inkjet or laser printer. Avery offers many easy-to-use templates for Microsoft Word and other popular software programs. Great for larger projects requiring more than one divider set. Three-hole punched dividers have a reinforced binding edge and are designed for use with three-ring binders. Save time by labeling all tabs at once using the Easy Apply™ label strip.